Hi there. I've taken a little time out today from a busy and hectic week preparing for a major project that is coming up soon. 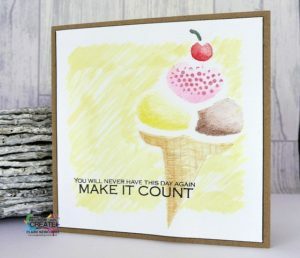 I've had the new Tonic Nuvo watercolour pencils sitting on my desk for a week or two, so today I decided it was time to sit and relax and try them out by colouring through one of Imagine Design Create's stencils - the Ice-cream and Sprinkles 6x6 inch stencil. I have designed new stamp sets for Imagine Design Create based around the idea of building your own monster character with stamps. The idea was to encourage children to have fun and make birthday cards for each other with stamps. The stamp sets offer a set of characteristics and body parts that can all be stamped separately, so that each creation can be customised and unique. Hi all!! How are we all? This week, I fell back into my comfort zone and created a card for you using one of my favourite characters, Finley Fox. I wanted to try something a little different with the Finley Fox stamps and thought I'd decorate this super cute little frame.